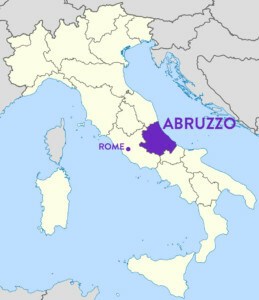 ABRUZZO: the land we both come from! Its traditions, its history and food will overwhelm you! Just two hours from Rome, Abruzzo has a central position in Italy, which makes it a perfect place to travel around the country. This almost-unknown gem between the Apennines and the Adriatic Sea has a history which goes back in centuries: Greeks and Romans have left their traces and traditions, enriching Abruzzo culture with their monuments, churches and towns. Its old little villages, where time seems to stand still; its green and rich hills, where olive groves and vineyards generously give their fruits every year; its beautiful mountains, which still keep the ancient traditions alive. Walk through its medieval towns and castles! Dive into history and legends! Be enchanted by its incredible landscapes, from the high peaks of its National Park to the gold sand shores of the Adriatic coast! Taste its exquisite and various traditional dishes! Learn how olive oil and cheese are made while you sip its award-winning wines! Take the Abruzzo road with us: wherever you stop, it’s a unique experience!